We only list items relevant to the areas encompassed by Sonning and Sonning Eye and ignore minor applications such as tree works etc. Full details of all planning applications are available on the relevant council's planning website and be accessed by clicking the title banner. Applications which are dealt with by Wokingham Borough Council (WBC) have a blue banner; a green banner signifies those dealt with by South Oxfordshire District Council (SODC). Clicking on the thumbnail location map will open up a larger Google Maps window. Adverse effect on the residential amenity of neighbours, including noise; disturbance; parking; overlooking; loss of privacy, overshadowing or loss of light etc. Negative effect on highway safety or the convenience of road users. If a member feels strongly about an application and would like the Society’s support, please contact one of our panel members or use the Contact Form (when it's available) to notify us. Full application for the erection of a medical consultation and treatment clinic (including sports and physiotherapy) plus cycle and refuse store, following demolition of existing sports club changing facilities, club bar and external store. Householder application for a proposed conversion of an open fronted garage to create habitable accommodation, including erection of front and side walls and front porch, changes to the existing boundary walls and creation of vehicular access and parking. Householder application for proposed erection of single storey front porch extension. Application to vary condition 1 of appeal planning consent 161529 for the erection of 13no dwellings. Condition 1 refers to the details of appearance, landscaping, layout and scale and seeks to allow the wording to be changed to facilitate access works and wider pedestrian improvements. Please note that we use GoogleMaps to identify the property concerned so, especialy in the case of new builds, the map pin may not indicate the precise location. We only list items relevant to the areas encompassed by Sonning and Sonning Eye and ignore minor applications such as tree works etc. Full detals of all planning applications are available on the relevant council's planning website. Full planning application for the proposed erection of a 1no. dwelling including landscaping. Householder application for the proposed erection of a single storey rear extension plus a single storey side extension to form porch with two rooflights, including changes to fenestration following removal of chimney and changes to roof. Additional copper standing to existing dormer re-pitching of roof over existing rear projection. Replacement of existing masonry wall to the front to include timber access gates. Householder application for the proposed erection of a first floor front/side extension; two storey rear/side extension and a two storey rear extension plus the erection of 2no side dormer extensions. Householder application for proposed part single storey, part two storey rear extension to existing dwelling and single storey front infill extension. Application for full planning permission for the demolition of existing house and garage and replacement with new single dwelling with annex/garage building. Householder application for proposed erection of single storey front/side/rear extension to dwelling plus open canopy porch, following demolition of existing single storey rear and side extensions. Householder application for the proposed single storey rear extension following demolition of existing kitchen. Listed Building application for consent for the proposed single storey rear extension following demolition. Householder application for the proposed erection of single storey rear extension, plus changes to fenestration and internal alterations. Application for Listed Building consent for the proposed removal of existing fence, creation of raised flower bed and tree to facilitate an new hard standing of granite setts with a relocated willow fence to form a new parking area. Full application for the proposed erection of 2no dwellings following demolition of existing dwelling. Householder application for the proposed erection of single storey rear extension, covered entrance porch to side elevation, single storey detached annexe building to the side/rear with garage, replacement of existing high wall at front with high timber fence and access gates, continuation of the existing brick wall that forms the boundary treatment with the highway at the Eastern end of the site at a low level in place of the existing picket fence, internal/external alterations and changes to fenestration. Application to vary conditions 2 & 14 of planning consent 153301 dated 28/04/2016 for sports and physiotherapy clinic building. Condition 2 relates to substituted and additional drawings and condition 4 to be reworded as: The premises shall be used for medical consultation and treatment (including sports and physiotherapy) and for no other purposes, including any other purpose in Class D1 of the schedule to the Town and Country Planning (Use Classes) Order 1987 (as amended) or in any provision equivalent to that Class in any statutory revoking and re-enacting that Order (with or without modifications). Householder application for the proposed erection of single storey detached outbuilding incorporating two roof lights. Householder application for the proposed erection of part single, part two storey side and rear extensions, including roof alterations. Full planning application for the partial demolition of "old Design & Technology" buildings and erection pitched roof to retained "Old Coach House" building, plus external works including the fenestration and erection of a new cycle shelter. Householder application for the proposed erection of first floor side extension. Full planning application for the proposed erection of 5 bedroom dwelling with double garage following the demolition of the existing dwelling. Householder application for the proposed erection of a two storey side extension to dwelling. Householder application for the proposed erection of single storey detached to create garage and ancillary accommodation. Full application for the proposed construction of single storey rear projection consisting of glazed infill (between it and the Great House), brick flank wall with chimney, retractable roof, and sliding front and side glazed panel elevations following removal of existing canopy. Householder application for the proposed erection of single storey rear extension to dwelling. Full application for the erection of a pair of semi detached dwellings with associated access and parking ( retrospective ). Householder application for the proposed erection of two storey side/rear extension plus single storey front extension, extension to the first floor front dormer and single storey front extension to enlarge porch. Householder application for the proposed erection of single storey side and rear extension following the demolition of the existing shed and store room. Application to vary condition 4 following grant of planning consent (163032) for the "proposed 18 space extension to existing "lower" car park with alterations to access and associated landscaping (163032) at the above site was allowed at appeal (APP/X0360/W/17/3179871)". Condition 4 relates to change the timescale from "Prior to commencement of the development" to "Before the removal of trees". Full planning application for the proposed erection of 3 no. dwellings with new access and parking following demolition of existing dwelling and detached garage. Householder application for the proposed part single storey, part two storey side and rear extension to dwelling. Application for variation of a condition 2 following grant of planning permission (172579)to allow amendments to footprint of the dwelling. Full planning application for the erection of electrically operated replacement Oak gates. Variation of condition 2 (approved plans) of Planning Permission P17/S0259/FUL Demolition of existing garages and ancillary structures; conversion of third & fourth floors of Mill building to form three apartments with related works on other floors; conversion of rehearsal/ accommodation building to form two dwellings; and all associated works. (Amended by plans received 2017_03_01 to include more parking spaces) (Amended by plans 2017_06_01 to include car port). Full application for the proposed construction of a front pergola; revised layout of the rear beer garden; relocation of existing bar; construction of a new disabled toilet plus erection of a new fence to the rear of the garden. Application for a certificate of lawfulness for the proposed erection of a single storey rear extension to dwelling. Householder application for the proposed single storey front extension following the demolition of existing uPVC conservatory and utility room. Listed Building Consent for the proposed alterations to reduce the current entrance lobby and W.C. to enlarge the vehicular access by 300mm and front garden alterations. New ancillary out-building with store over. Grade II listed building. Prior notification application for the proposed erection of a 5-bay agricultural barn open-sided to the south. Householder application for the proposed erection of single storey side and rear extensions, erection of outbuilding, plus reposition of existing tennis court and western boundary. Full planning application for the proposed erection of a replacement half storey sports pavilion and detached maintenance store following demolition of existing pavilion. Application for Listed Building Consent for the replacement of windows and surrounds, new boiler flue installation, repairing small features to match adjoining gates. Full planning application for the proposed change of use of land from residential garden to car parking, ancillary to the Great House at Sonning. Application to vary condition 2 of planning consent F/2014/1832 (140734) for the erection of two storey side, rear and front extension to dwelling, following demolition of existing conservatory. Condition 2 relates to approved details. Listed building consent for the proposed replacement of existing kitchen doors and frame with a higher sill and replacement of existing lounge doors for a window. Householder application for the proposed erection of a part single/part two storey rear extension, a single storey front porch extension, plus the addition of a mezzanine floor with rooflight and the part conversion of garage to create habitable accommodation to dwelling. Householder application for the conversion of loft space to habitable accommodation with rear dormer extension to dwelling and new gable end. Full application for the proposed erection of 4no bedroom detached dwelling following demolition and removal of existing dwelling. Full application for the proposed erection of replacement dwelling with basement and detached double garage and store following demolition of existing dwelling. Application for submission of details to comply with the following condition of planning consent 170118 (dated 18/4/17) - 8. Process and means of updated Travel Plan. Full application for the proposed erection of 3no dwellings following demolition of existing dwelling and detached garage. Householder application for proposed erection of two storey rear extension and demolition of existing garage. Full application for the proposed construction of multi-use games area with associated fencing, lighting and surface treatments. Listed building consent for temporary removal of gates and superstructure plus renovations and repair of gates to include repainting (Part Retrospective). Householder application for the proposed erection of single storey part two storey rear extensions to dwelling. Householder application for the proposed erection of part two side storey extension plus erection of single side extension to dwelling. Listed Building for the proposed erection of part two side storey extension plus erection of single side extension to dwelling. Householder application for the proposed erection of a single storey rear extension with glazed lantern and erection of rear dormer extensions to converted loft space. Householder application for the proposed erection of a single storey rear extension, to include 2no dormer window extensions and erection of a rear outbuilding to form a garden office. Non-material amendment application to planning consent 170093 to allow additional side windows. Demolition of existing garages and ancillary structures; conversion of third & fourth floors of Mill building to form three apartments with related works on other floors; conversion of rehearsal/ accommodation building to form two dwellings; and all associated works. (Amended by plans received 2017_03_01 to include more parking spaces) (Amended by plans 2017_06_01 to include car port). Full application for the proposed demolition of existing dwelling and replacement with new dwelling with basement and garage annex. Householder application for the proposed erection of a two storey side extension to dwelling, to include a dormer extension, following demolition and removal of existing single storey and part catslide roof. Full application for the proposed use of land for the stationing of caravans for residential purposes for 2no gypsy pitches together with the formation of utility/dayrooms and hardstanding ancillary to that use. Please note that this appeal is linked with enforcement appeal APP/X0360/C/16/3157598 (170166). The panels below describe some of the activites that the Highways & Traffic section are currently engaged with. We hold monthly meetings to discuss planning applications and other issues and these are open to members of the Society. The Panel are currently working with the Sonning Parish Council Highways Working Group to develop a long term strategy to reduce the impact of the large volumes of traffic that pass through the two villages. This will also seek to reduce the amount of street signs that clutter up the villages. In connection with the Sonning Lane parking problems you will have noticed there has been a major improvement in the situation. There are now often only six cars in the area where there used to be up to sixty cars. Reading Blue Coat School has made an arrangement with the Berkshire County Sports Club for pupils to park in the car park opposite the school entrance and extensive work has been carried out in the car park to make this possible. The major involvement of the Headmaster, Mr Jesse Elzinga, who was determined to do something about the street parking, is acknowledged. In addition, Wokingham Borough Council has put forward a proposal to make parts of Sonning Lane ‘no waiting at any time’ areas with appropriate yellow lines. These will hopefully be the narrower, primrose in colour lines rather than the bright yellow lines. Formal notices of intention by Wokingham Borough Council have been displayed in Sonning Lane. Work is underway on an updated local plan which will shape the future of Wokingham Borough. As part of the Local Plan Update process, we need to understand what land is available for new housing, business and leisure development, and other uses. A number of sites across the Borough have been suggested to us to be consider for development. The next stage of the plan, the Preferred Options Consultation, is now anticipated to be in the summer 2018. The changed timetable is necessary to allow further detailed work to be undertaken on infrastructure and other potential impacts and opportunities. The detailed programme will be set out in a new Local Development Scheme in the next couple of months. You can now have your say on the proposals for the Local PLan Update this will guide development in the Borough for the next 20 years and also the gypsy and traveller local plan since its publication by WBC. 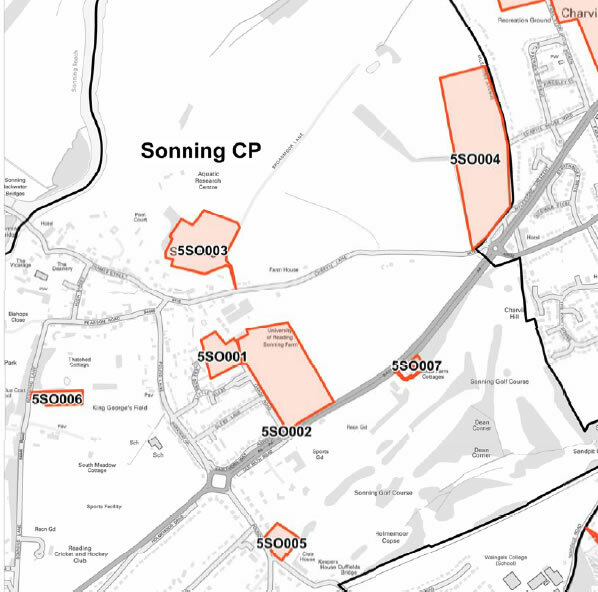 There are six sites currently listed in Sonning and all have been strongly objected to by the Sonngin Parish Council. The Society is continuing the monitor the consultation and will be represented at one of the meetings. 5SO007 Land Adjacent to Model Farm Cottages Bath Road 0.19 Housing (C3 Planning Use Class). Pitches for Gypsy and Travellers and plots for Travelling Show People. Self-Build. 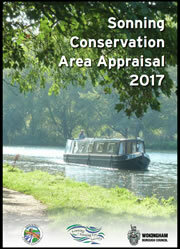 The Conservation Area Appraisal was adopted on 19th April 2017. We are pleased to report that the 2017 Sonning Conservation Area Appraisal (SCAA) was adopted by Wokingham Borough Council (WBC) at their meeting on 7 April and became effective on 19 April 2017. Conservation areas (CA’s) are areas of special architectural or historic interest. Local Planning Authorities (LPA’s) have a duty to designate these areas under the Planning (Listed Buildings and Conservation Areas) Act 1990 and ‘from time to time’, to review the boundaries and to formulate proposals to preserve and enhance their special historic and architectural character. Since 2012 the Council has been working with the Parish Council and Sonning & Sonning Eye Society in the production of an appraisal document for Sonning CA. The Parish Council and Sonning & Sonning Eye Society have carried out the research and produced the draft document. This was passed to the Council to finalise and consult on. A 6 week public consultation has been undertaken and amendments have been made to the appraisal to reflect consultation responses. It is now proposed that the document is adopted by the Council and will constitute a material planning consideration in assessing planning applications. The Appraisal assesses the special architectural and historic significance of the conservation area through considering issues such as the layout, open spaces, trees and landscape, focal points and important buildings. The Appraisal identifies both positive features and those which are considered to detract from its special interest of the area. It also highlights vulnerabilities and opportunities for enhancement. The designation of a conservation area gives the LPA additional controls over the demolition of unlisted buildings and works to trees, restricts some permitted development rights and tightens regulations on advertising. Once designated, the LPA has a duty to have special regard to the desirability of preserving or enhancing the character or appearance of their conservation areas in undertaking their planning duties. In providing an up to date assessment of the character of the conservation area, this Appraisal is a material planning consideration. The Society would like to thank all the volunteers who comprised the teams who went round the village to record the details that were to define the special features that make Sonning special. Copyright © 2005-19 Sonning & Sonning Eye Society. All rights reserved.